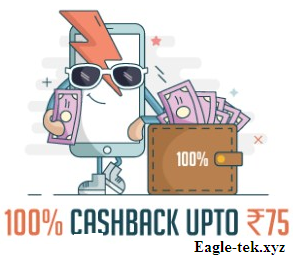 Freecharge comes with a new offer in which you will get a cashback of Rs.75 In this offer you will get a 100% cashback, if you have a new SIM card then you can take advantage of this offer. So let’s know how to apply the offer. Once your Promo code is Applied successfully then Make the Payment using a Debit/Credit card only. That’s it, you will get your Cashback in your FreeCharge wallet within 24 hours. 31-Jan-2019. Applicable for New users only. If you liked Freecharge offer, please share this offer with your friends, so share with your friends so that everyone can know about these offers and he also earns a lot of cashback. Thank you for reading. If you like this post Please share this post. Thank you.